Get started on your first project with theg Spring Roo open source RAD. You'll be guided through the source code, common commands, dynamic finders, remoting support, incremental database reverse engineering, and removing Spring Roo. ► But Wait... There's More! 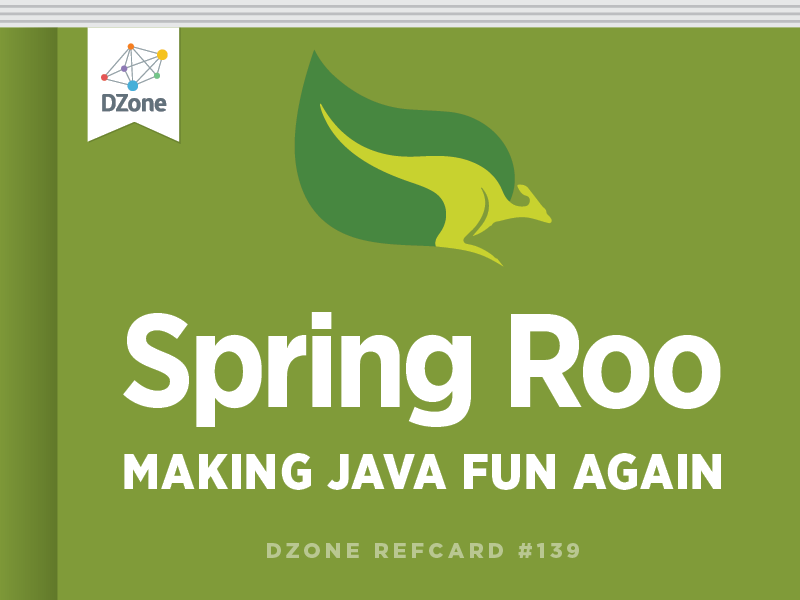 Spring Roo is a popular open-source rapid application development (RAD) tool for Java developers. It enables the developer to build best-practice, high-quality, lock-in-free enterprise applications in minutes – a task that would otherwise take days if not weeks. Developers using Roo can fundamentally and sustainably improve their productivity without compromising engineering integrity or flexibility. Roo is highly modular: it allows developers to extend its functionality by installing new add-ons in a secure and trusted way. You can load the Spring Roo shell in the background and let it monitor your project or directly interact with it by issuing shell commands. The shell offers many usability features such as tab completion, context awareness, help and hinting support and automatic roll-back. Roo even keeps a log of your shell commands so you can easily replay them if desired. Projects created with Spring Roo are standard Java enterprise applications using the Spring Framework. This means you’ll find all the typical artifacts such as Java source files, XML configuration files, properties files and view artifacts such as jspx files in your project. Besides automatic configuration of Maven build artifacts, logging and dependency injection, Roo allows you to connect to or transparently create new backend databases. It achieves that by automatically configuring the Spring application context for your database and object relational mapping (ORM) tool through the Java Persistence API (JPA) standard. Transaction management is also configured out of the box. Furthermore, it can take care of maintaining your JUnit integration tests, Web front-ends and other common project layers. One of the major benefits of using Spring Roo is its deep integration of AspectJ’s inter-type declaration (ITD) features. This allows Roo to automatically produce and maintain boiler-plate code such as getter and setter methods in a different compilation unit (the .aj file). AspectJ ITD files are kept separate from the normal .java code you’d write as a developer so Roo can maintain the file’s lifecycle and contents completely independently of whatever you are doing to the .java files. Your .java files do not need to do anything unnatural like reference the generated ITD file and the whole process is completely transparent. Spring Roo selectively merges the best of the passive and active code generation models. Roo will passively ‘watch’ (i.e., read and monitor) any activity in your project’s .java sources and automatically adjust the AspectJ ITDs in the background to support your activities. For example, typical domain classes only contain field definitions that are either added through Roo shell commands (passive generation – the user asks for it) or manually added by the developer in the IDE. Boilerplate code like toString(), accessors and mutators for the fields as well as many other functionalities are then transparently added and managed in the ITDs. Roo will actively make adjustments in the ITDs when the developer renames or deletes the field from his Person.java file. Note that source code members like the toString() or getName() and setName() methods in a separate file (.aj) are fully available for code completion in modern IDEs such as STS and IntelliJ thanks to fully integrated support for AspectJ Eclipse. Since the ITDs are not expected to be edited by the developer, Roo can manage the contents of an ITD actively. This allows Roo to integrate new features in Spring Framework once they become available or make the code more efficient simply by updating the ITD sources when upgrading to a new version of Spring Roo. The ITD files are automatically managed by the Spring Roo shell, which is kept running in the background while developing your project. The contents of the ITDs can be controlled and customized by Java annotations placed in your .java source files. These annotations always start with @Roo and are source level retention only: hence, they are not compiled in your .class files. This means that Roo-managed applications deployed to production environments have absolutely no dependency on Roo itself. You can observe this by taking a look at your application runtime class path; for example, in Web applications, your WEBINF/ lib directory will contain no Roo-related JARs. The use of Spring Roo as a productivity RAD tool that is present only at development time brings many advantages; you avoid lock-in, keep full flexibility for future extensions and gain better performance due to the absence of additional runtime dependencies. Furthermore, there is no scope for possible Roo bugs to affect your project, and there is no risk of upgrading to a later version of Roo due to the lack of executable code anywhere in your project class path. Depending on the requirements of the application, there are a number of approaches to designing and subsequently layering a Java enterprise application. Persistence logic is often encapsulated in a Data Access Object (DAO) layer in combination with an additional repository layer. In front of these persistence layers, developers frequently use a façade or service layer, which can contain business logic that applies to multiple domain types. In MVC-style Web applications, there is a controller layer and finally there is a domain layer. There are ,of course, any number of alternative approaches to architecting enterprise Java applications. In a typical Roo application, you’ll only use an entity layer (which is similar to a domain layer) and a web layer. An optional services layer might be added if your application requires it, although a DAO layer is rarely added. The domain entity approach taken by Roo is conceptually related to the active record pattern employed by many modern RAD frameworks. Through the use of separate ITDs for adding different functionalities to a target type, Roo applications still adheres to the separation of concerns principle. For more information on high-level features and concepts employed by Spring Roo, refer to the first sections of the reference documentation. Spring Roo is easy to install as standalone tool and runs on Windows, Mac OSX and Linux alike. Integrated development environments (IDEs) for Java such as the SpringSource Tool Suite (STS), Eclipse (+ AJDT) and JetBrains IntelliJ also integrate Spring Roo directly into their toolset. The only prerequisites for running the Spring Roo shell are a working Java 6 SDK and Apache Maven (2.0.9+) installation. Once these two are installed, you can go ahead and download and unpack the Spring Roo distribution. You can find the ~7MB download for the latest release of Spring Roo at http://www.springsource.com/ download/community?project=Spring%20Roo. Once downloaded, simply unpack it into and add it to your path. Windows users can add %ROO_HOME%\bin to their path and *nix users can create a symbolic link to $ROO_HOME/bin/roo.sh. Alternatively, you can install STS, which includes an integrated version of the Spring Roo shell without any need for further configuration. The Spring Roo shell offers hinting support for newcomers. This way you can learn about the suggested steps beginning with the creation of a new project, followed by configuration of persistence features to the creation of your first domain classes. Tab completion plays a central role when using the Spring Roo shell. By simply hitting the Tab key, the Roo shell will offer commands, command attributes or even brief comments about the functionality offered by a command or a command attribute. Typing the first letters of a command followed by Tab will complete the command. Subsequent uses of Tab will complete mandatory command attributes until a user selection or input is required. Note, the integrated Roo shell in STS uses the Ctrl + Space key combination familiar to Eclipse users in lieu of the Tab completion in the standalone Roo shell. The Roo shell will automatically hide commands, which are not applicable in the current context. For example, the ‘persistence setup’ command will not be shown when using Tab before a new project has been created using the ‘project’ command. Roo also offers help for any of the commands it offers. To see help details for the ‘persistence setup’ command, simply type ‘help persistence’ and Roo will present a short description and also all mandatory and optional command attributes along with a brief description for each. Finally, the Roo shell will automatically rollback changed files in case a problem is encountered. As you can see, Roo has created a standard Maven project layout with a Spring application context and a Log4J configuration. After the creation of the project, you can type ‘hint’ and follow the suggestions for your next steps. Note, the integrated ‘hinting’ support is context sensitive. This means that the ‘hint’ command is aware of state of your project and adjusts its suggestions accordingly. For example, after the creation of a new project, the ‘hint’ command will suggest to configure your persistence setup. Of course, you can refine your domain model through the Spring Roo shell or directly in your .java source code, create new types, fields, references, etc. Once your work is complete, you may want to test the integrity of your domain model by running the Roo generated integration tests. You can do that by running ‘perform tests’ in the Roo shell, ‘mvm test’ in your normal shell or through your IDE. The integration tests will execute against your configured database and the test data will be cleaned up automatically after the tests have completed. You will notice that the toString() method looks just like a normal Java method with the only difference of the AspectJ target type definition in front of the method name. Furthermore, AspectJ type definitions use the ‘privileged aspect’ definition instead of ‘public class’ you would see in typical Java sources. void persist() Save a new person record. Person merge() Update an existing person record. void remove() Remove an existing person record. Person findPerson(ID) Find a person record by ID. List<Person> findAllPeople() Retrieve a list of all persistent Person records. List<Person> findPersonEntries(from, to) Retrieve a list of persistent Person records for a given range. long countPeople() Return a count of all Person records. Let’s recap what you have done so far by issuing just a few commands. You have created a fully configured and working enterprise Java application using Maven, Spring Framework with features such as dependency injection, transaction support, MVC, JSP, Tiles, CSS, Dojo, JPA, AspectJ, Java Bean Validation (server and client side), JUnit, Log4J and more. project --topLevelPackage [..] Creates a new Spring Roo managed project. [..] --database [..] Installs or update a persistence provider and a database connection for your project. entity --class [..] Creates a new persistent entity in your project. boolean | date | set | [..] Inserts a private field into the specified java file. enum type | constant [..] Inserts enum types and constants into your project. test integration | mock | stub Creates a new integration | mock | stub tests for the specified entity. controller all | scaffold [..] Creates a Spring MVC UI for your domain model. gwt setup Creates a GWT UI for your domain model. security setup Installs a Spring Security configuration for your project. logging setup --level [..] Configures logging in your project. As you have guessed, so far we have barely scratched the surface of Spring Roo. There are many more features offered by Roo. With the Roo 1.1.x release, a new add-on called ‘incremental database reverse engineering’ (DBRE) was added to Roo’s toolset. DBRE allows you to create a complete JPA-based domain entity layer based on the introspection of tables in your database. In addition, DBRE can maintain your domain entity model incrementally to synchronize all changes to the data model. For example, data model changes such as adding, removing or renaming tables or columns in your database will be detected by DBRE. DBRE has been designed to enable developers to repeatedly re-introspect a database schema and synchronize all changes with the application domain model on demand. This approach is different to traditional JPA reverse engineering tools, which introspect a database schema and produce a Java application tier only once. You can now try out the DBRE add-on by using the ‘database introspect’ command, which displays the database structure, or schema, in XML format. This can be used to preview the domain model structure which DBRE will create based on your data schema. Once the domain model has been created, you can scaffold a Web UI of your choice (see previous section). Note, the finder add-on creates a new AspectJ ITD, which introduces the findPeopleByBirthDayBetweenAndNameLike(Date minBirthDay, Date maxBirthDay, String name) method to the Person.java target type. Spring Roo offers an add-on to integrate JMS functionality into your application. Specifically, this add-on allows you to define a message sender, a message listener and even the configuration of an in-memory message queue service (based on Apache ActiveMQ). Optionally, to support asynchronous execution of the message sending functionality you can easily add the new @Async feature introduced in Spring Framework v3. The add-on will take care of adding all necessary configurations and dependencies to your application. This will create a dependency injected field of type JmsTemplate and also a sendMessage(Object message) method in the target type. This will create a dependency injected field of type MailSender and also a sendMessage(String mailFrom, String subject, String mailTo, String message) method in the target type. String toJson() Serializes Person to a JSON representation. Person fromJsonToPerson(String json) Creates a Person instance from a JSON document. String toJsonArray (Collection<Person> collection) Serializes a collection of people to a JSON array representation. Collection<Owner> fromJsonArrayToOwners(String json) Creates a Person collection from a JSON document. Sometimes, the developer may want to customize the way a certain member is implemented that is provided through a Roo ITD. Since code changes to the Roo managed ITDs are not preserved, the developer needs a way to take control over the member without loosing Roo’s benefits of maintaining the rest of the members provided in the ITDs. Spring Roo offers a convenient approach to this called ‘push-in refactoring’. Push-in refactoring is achieved by simply moving the member that needs customization from the ITD to the associated .java source file. You can do this manually in a text editor by simply copying the code from the ITD and pasting it into the target .java file (and removing the AspectJ target type definition from the member signature) or by leveraging the ‘pushin refactoring’ support in Eclipse / STS. Roo will automatically detect if a member (i.e., a method or field), which it could code-generate in an ITD, is present in the target .java source file and refrain from adding it to the ITD (or remove it if it is currently present). Due to its passive approach with regards to any code found in .java source files, Roo will simply read your member and make adjustments to the ITDs if appropriate. This will allow you to customize the member in your .java sources without any interference by Roo. As mentioned in the first section of this Refcard, Spring Roo does not lock the developer in. Due to its nature of being a development-time only RAD tool, it is almost trivial to remove all Roo artifacts from your project. Before removing Spring Roo from your project, we recommend to back up your project by simply using the ‘backup’ command. As discussed in the previous section, Eclipse / STS offer push-in refactoring of individual members. In fact, it does not only offer this for individual members but also for complete types, packages or even your complete project. So a push-in refactoring of your project will move all source code from the Spring Roo managed AspectJ ITDs into their respective Java source targets. While your project is now free of AspectJ ITDs, your .java files will still have @Roo annotations within them. In addition, there will be import directives at the top of your .java files to import those @Roo annotations. You can easily remove these unwanted members by clicking Search > Search > File Search in Eclipse / STS, containing text “\n.*[@\.]Roo[^t_]+?. *$” (without the quotes), file name pattern “*.java” (without the quotes), ticking the “Regular expression” check-box and clicking “Replace”. When the following window appears and asks you for a replacement pattern, leave it blank and continue. You can delete (or comment out) the entire <dependency> element. If you’re running STS or Eclipse with m2Eclipse installed, there is no need to do anything further. If you used the command-line mvm command to create your Eclipse .classpath file, you’ll need to execute mvm eclipse:clean eclipse:eclipse to rebuild the .classpath file. Roo has now been entirely removed from your project and you should rerun your tests and user interface for verification of expected operation. If you wish to re-enable support for Roo ITDs in your project, you need to add/enable the Roo annotations jar dependency in the project pom.xml, annotate the relevant java sources with the @Roo annotations and then use the Eclipse / STS Refactor > Pull Out ITD feature to move the source code out of your java sources. This is required because Roo takes a passive approach to managing your java source files. This means it would not touch any code in your java source files unless you explicitly tell it to. Spring Roo delivers serious productivity gains to Java developers. It offers integration with popular, proven Java technologies you already know. It is easy to learn, easy to use and easy to extend. It builds on Java’s strengths. It supports the developers to create best-practice enterprise Java applications with excellent performance while maintaining engineering flexibility with no runtime, no lock-in and no risk. The only prerequisites for running the Spring Roo shell are a working Java 6 SDK and Apache Maven (2.0.9+) installation. Once these two are installed, you can go ahead and download and unpack the Spring Roo distribution. You can find the ~7MB download for the latest release of Spring Roo at http://www.springsource.com/ download/community?project=Spring%20Roo. Once downloaded, simply unpack it into and add it to your path. Windows users can add %ROO_HOME%\\bin to their path and *nix users can create a symbolic link to $ROO_HOME/bin/roo.sh. While your project is now free of AspectJ ITDs, your .java files will still have @Roo annotations within them. In addition, there will be import directives at the top of your .java files to import those @Roo annotations. You can easily remove these unwanted members by clicking Search > Search > File Search in Eclipse / STS, containing text “\\n.*[@\\.]Roo[^t_]+?. *$” (without the quotes), file name pattern “*.java” (without the quotes), ticking the “Regular expression” check-box and clicking “Replace”. When the following window appears and asks you for a replacement pattern, leave it blank and continue.